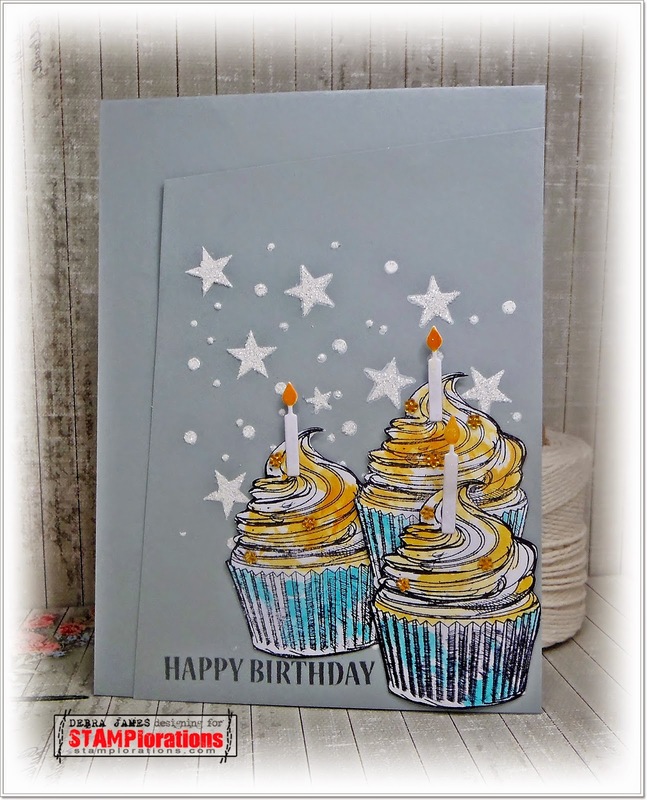 one card at a time.. Debra James: STAMPlorations Birthday Blog Hop! Please visit my Instagram account jamesee22 to see ALL my cards as I don't always/very often post here, cheers. 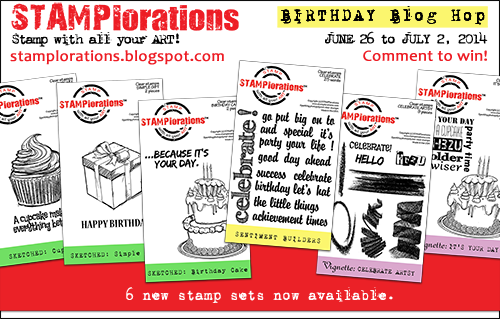 STAMPlorations turns a year old this month and we're celebrating with a blog hop! We're also releasing the new stamps for July so it's a double celebration. 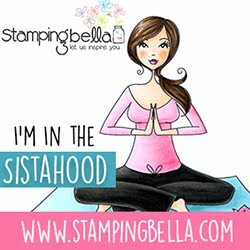 The other STAMPlorations girls and I are sharing projects we created that feature the new stamps. And we've got 5 talented card-makers celebrating with us too! Visit all the stops on the hop and leave a comment for a chance to win stamps. We're giving away over $120 worth of stamps! I used the yummy CUPCAKE Stamp.. I just love this stamp, isn't it FABULOUS... and did a little watercolouring on the stamped images. The sentiment is from the Simple Gift Stamp. I have long admired fellow DT girl Shirley-bee and the way she does splotchy water colouring and have been itching to give this go- so this is my take on her technique... Thanks for inspiration Shirley. I used gesso thru a Memory Box stencil and while still wet added some ultra fine glitter.... followed by some bling, candle dies. I stamped the sentiment with a Adirondack grey ink. Nice! those cupcakes surely standout against the gray color. The colour grey you chose is bringing out the shiny stars . I just love the watercolour technique you used in the cupcakes. Great work!!! Beautiful, fairytail feeling card. Thanks for the hop. Love the background and your water color technique. The offset panel adds nice visual interest. Brilliant card, I love the layout and the colours are fabulous. Oh, these cupcakes look scrumptious! I'm going to try leaving more white space instead of border-to-border coloring - I love the effect you created on the cupcakes. Just wonderful. Both the card and the sets. Would love to win and try them out! Great background to set the cupcakes against. Enjoying this hop immensely. Love this technique! Great card. Oh simply fabulous coloring on these yummy cupcakes! Love the way you only slightly coloured the cupcake papers and then again the icing. Yummy looking! Great job. Wow this looks so cool love the way you did the icing! I just love your card, Debra! The coloring is superb and with the stars and the candles it has such a festive feel! The new stamps are great. I paarticularly love the cupcake and how you have used it in your card. Love the blue that you used, the design with the stars; a great card! Debra, you've worked magic with these cupcake stamps; they are stunning with the 'selective' colouring. Such a gorgeous showcase of the new release AND your creativity! Fabulous! oh WOW that is SUPER!! And I am LOVING the feathers you have up for a prize. Gosh - these images are great! I like every inch of this card. The bit of distressed look on the cupcakes is perfect. Wonderful use of the cupcakes with stars! This screams PARTY! Oh, love your card and how you colored the cupcakes -- super pretty! Wow! I love everything here! The stars look amazing so luminescent! I also love the watercolour cake! Yummy looking cupcakes and I totally love the vellum with the stars!! Awesome!! Great coloring on the cupcakes and the stars are the perfect backdrop. What a gorgeous card. Your creations are amazing! I like your cupcakecard and the colors. The stars are the hit!!! Very pretty! Love the cupcake stamp and I also love the gessoed and glittered stars! Fabulous card. Such a sparkly fun card. Love the stars. Great Cupcakes, they look delicious. Beautiful card and great blog hop! Love your watercolored cupcakes... yum! Gorgeous colors! Oh, I just love this cupcake stamp and the way you colored it. 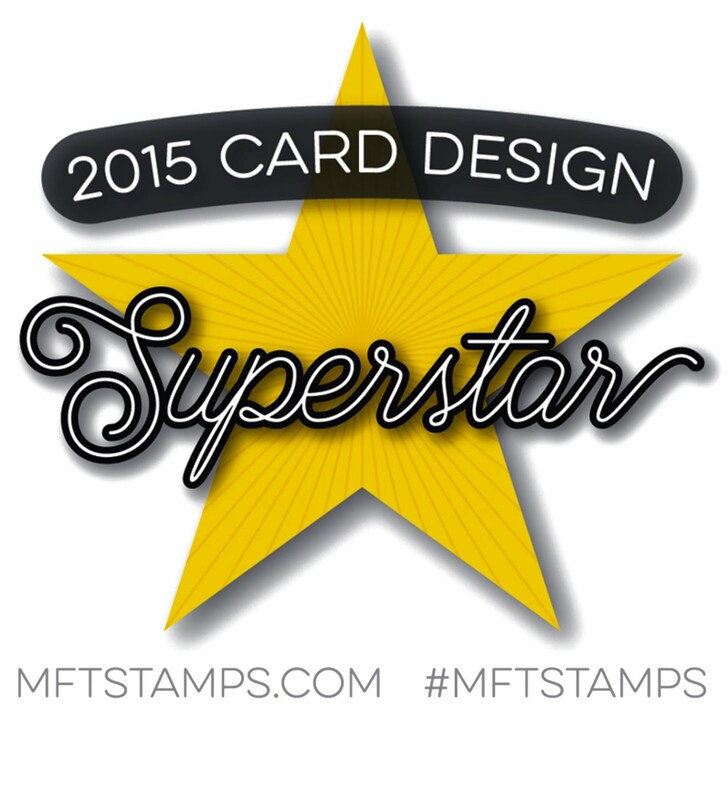 Your feather stamp would be awesome to win. Thanks for the chance. Debra- Love the gesso thru a stencil idea! Happy Birthday STAMPlorations! I love your trio of cupcakes and the glittery stars- great textures! Thanks for the inspiration! Thankyou so much for taking the time to leave a comment.